Niagara Health’s Kidney Care team was recently recognized for their work in partnership with St. Joseph’s Healthcare Hamilton for a joint learning workshop for Hemodialysis Nurses. 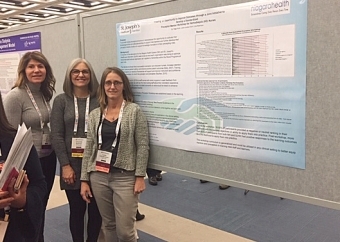 The team shared details of this successful workshop at the Canadian Association of Nephrology Nurses and Technologists Conference (CANNT) in Quebec City in late October. The team placed third overall for their poster presentation. This learning workshop – a new initiative for both Kidney Care teams - took place earlier this year, providing renal nurses with an opportunity for growth and development. The workshop, which consisted primarily of hands-on learning, proved to be mutually beneficial for both organizations. "The workshop provided staff with an opportunity for role-modelling, giving feedback, learning and growing," says Niagara Health Kidney Care Program Nurse Educator Lezlie Lambert-Burd. "It promotes a culture of openness, trust and engagement." The team collected data to evaluate the impact of the workshop and found there was measurable improvement with learning outcomes and staff satisfaction, which may ultimately have a positive impact on patient care. "I am very proud of the work of our Kidney Care team and this extraordinary achievement," says Martin Ruaux, Director, Patient Care, Executive Lead & Chief Nursing Officer, St. Catharines Site. "This workshop collaboration demonstrates their commitment to continuous improvement and promoting a culture of learning." Learn more about our Kidney Care Program here.